Snowball Church is the UK branch of the Bola de Neve Church International Christian Ministry which is founded in Brazil. It’s an evangelical church Pentecostal Brazilian and was founded in Sao Paulo in the 1990’s for Rinaldo Luis de Sexias Pereira, the Apostle Rina (Rev. Rina), pastor and surfer with a degree in marketing. The church do a lot of work for charity, fundraising and helping their local communities. 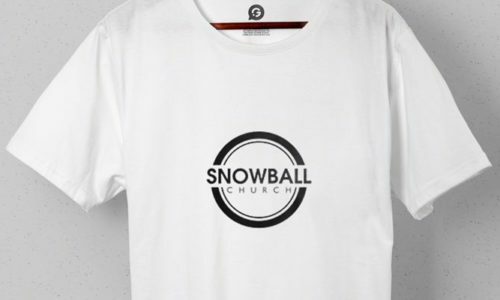 Phil, a member of the Snowball Church, contacted us to get some T Shirts printing for a variety of events which he was organising throughout the summer. He needed over 30 black T Shirts, both in adult and children’s sizes, with the church logo on the front breast and on the back. We new that mixing both adult and children’s sizes can be tricky when you’re trying to keep a consistent look throughout all the garments – especially when using screen printing as it required making multiple screens to achieve the perfect print across all sizes. For this reason we decided that it would be better if we opted to use two different printing techniques to be used across the order – Screen Printing for the adult tee’s and Cad Cut Vinyl for the children’s. This allowed us to vary the size between the two while removing the set up fee’s for screen printing both sizes. The T Shirts were delivered and the client was very pleased with them. Since they were printed they have been used for a number of events and gives the group and more professional appearance. “The order was great thank you, everything was fab from start to finish: customer service -> ease of design / assistance -> speedy delivery -> all items present and correct -> marketing / PR purpose.